I have a gorgeous photo of myself when I was about three years old where I’m meticulously dismantling and rebuilding my lovely bright yellow tricycle on our back patio (I’ve unfortunately lost that handy streak as an adult). It’s one of my favourite childhood photos and is now the memory I have every time I see a vintage-styled tricycle. 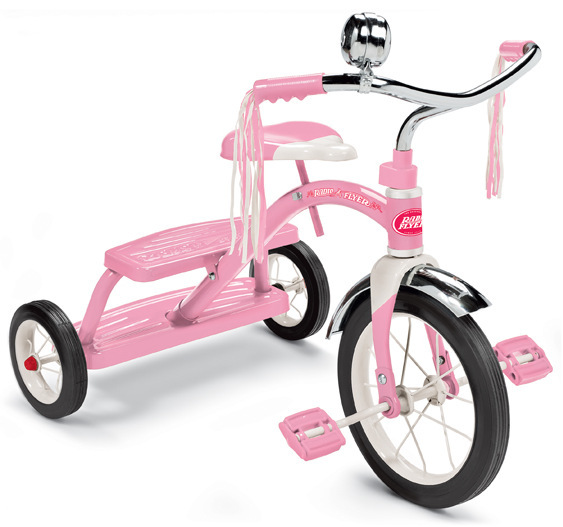 That most definitely applies to the Radio Flyer Classic Dual Deck Tricycle in the wonderful new hue of pink. Having just arrived on Australian shores, nostalgia abounds as it’s the trike a lot of us grew up on. Passing those lovely moments riding on our trusty Radio Flyer tricycles onto our children is impossible to resist. It’s made of the best materials – no plastic here – including a steel frame and wheels with chrome handlebars and fender. Head straight to Toy Guru to purchase the new pink or the original red for $189.